A memorial service commemorating the life of Lawrence University Professor Emeritus of German Dorrit Friedlander will be conducted Saturday, June 21 from 9-10 a.m. in the Nathan Marsh Pusey Room of the Warch Campus Center. Professor Emeritus of German Dorrit Friedlander, 1925-2013. The service will include remarks from Dave Burrows, provost and dean of the faculty, Brian Pertl, dean of the conservatory, and Friedlander’s niece Rabbi Ariel Friedlander. Several alumni will share stories from their time with her in Germany. It will also feature music from her favorite composers and a slideshow. The room will remain open until noon for faculty, staff, alumni, family and friends to spend time celebrating her special life. One of the college’s most beloved teachers and, with 61 years, the longest-serving faculty member in the college’s history, Friedlander died peacefully Nov. 14 at her Appleton home at the age of 88 after a battle with liver cancer. Friedlander joined the faculty in 1951 for what was supposed to be a one-year appointment and never left. She taught both German and Spanish for her first seven years before focusing solely on her primary passion, German. 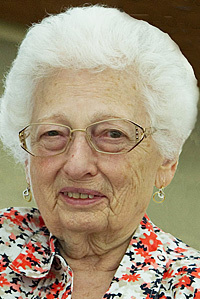 Although she officially retired in 1993, she continued to teach at least one course each year up through the fall of 2012. A dedicated but demanding teacher, Friedlander always held her students to high standards, both in the mastery of good German as well as the manners of good living and she insisted that civility and kindness prevail. Known affectionately to generations of students as “Tante Dorrit” or “Frau Friedlander,” she won the admiration and affection of students through the personal interest she showed each of them as well as the delicious cheesecakes she made. Friedlander’s love of teaching extended beyond the campus borders as well. She was instrumental in establishing Lawrence’s first foreign language study program in 1967, a venture in Bönnigheim, Germany, and was a frequent and popular director of the college’s study-abroad programs in Eningen and Munich, Germany. She proudly embraced the role of university matriarch in various forms, overseeing faculty office assignments in Main Hall for many years and making sure the receiving line at the annual year-opening reception for new faculty moved along at an acceptable pace. Each fall, Friedlander organized the Main Hall holiday collection, providing a year-end bonus for the building’s staff in appreciation of their efforts throughout the year. She also served as a “house mother,” first at Sage Cottage, a former women’s dormitory (now the International House) and later at Ormsby Hall. Long after the practice of house mothers ended, Friedlander continued to regularly reserve a lunch table in Lucinda’s for Ormsby students so she could stay connected. She diligently supported her students outside of the classroom as well, often attending their recitals, theatre performances and art exhibitions. During her life, Freidlander’s genuine affection for people helped her cultivate a large and very diverse group of friends from around the world and from all walks of life. Born in 1925 in Berlin, Germany, Friedlander and her family fled the Nazis in the late 1930s, catching one of the last boats leaving Germany and winding up in Havana, Cuba as a young teenager. She emigrated to the United States in 1940, resettling with her family in Mississippi. She attended the University of Cincinnati, where she earned a bachelor’s degree in Romance Languages and a master’s degree in German. She spent a year teaching German and Spanish at the University of Oklahoma before coming to Lawrence. At her request, memorial contributions can be made to Lawrence’s Dorrit Friedlander Scholarship Fund.